The word Czech Republic brings to my mind images a mug of frothy beer and Skoda cars. It is difficult to picture this Pilsner country as a wine drinking nation. 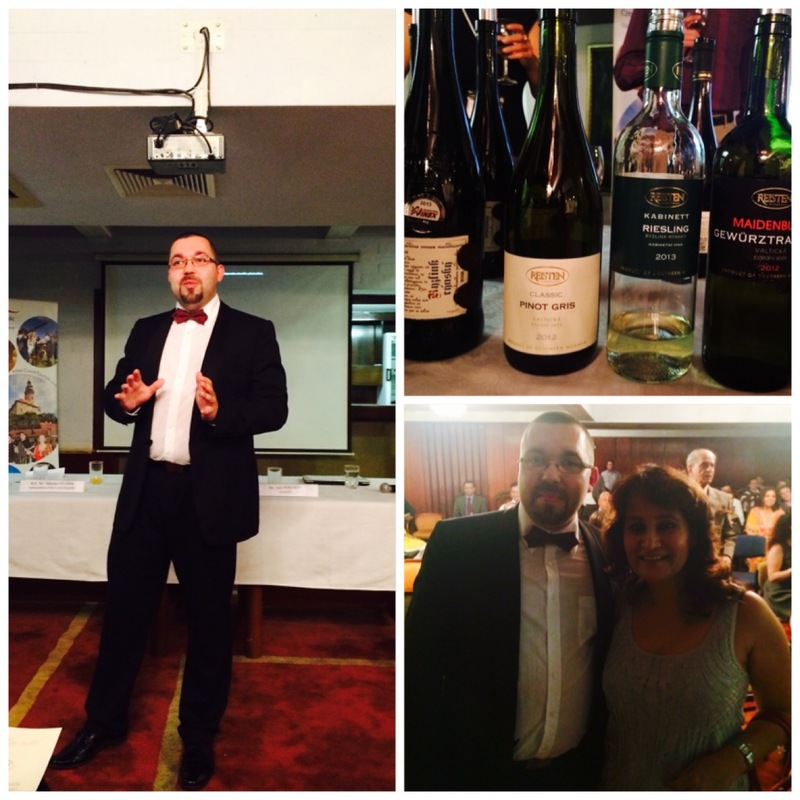 When I was invited by my friend Alison Macbeth to a Wine tasting event at the Czech Embassy in New Delhi, I was a little sceptical as to what would be on offer as I had never even seen a bottle of wine from this country let alone taste it. The little knowledge that I had about Czech wines was limited to half a page devoted to them in the 7th edition of The World Atlas of Wine by Hugh Johnson and Jancis Robinson. 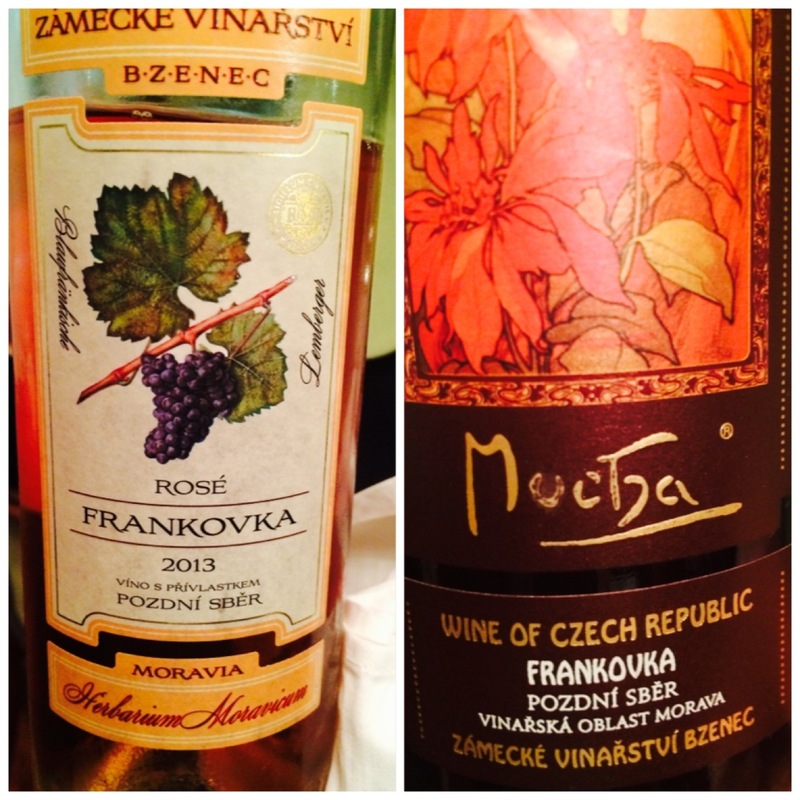 What I knew from before was that Czech wines are also known as Moravian wines, as wine production is centred on Southern Moravia, from where 96% of the wines come from. The rest 4% come from Bohemia, a region further north, closer to Prague. Since the region is just across the border from Austria, I could hazard a guess that there would be a lot of similarity in the principle grape varietals grown in both countries like Grüner Veltliner, Riesling, Welchriesling, Sauvignon Blanc, Pinot Blanc and Gris, Gewürztraminer and some black grape varietals like Pinot Noir, Blaufränkisch and Zwigelt. I was keen to discover some local varietals not found elsewhere. 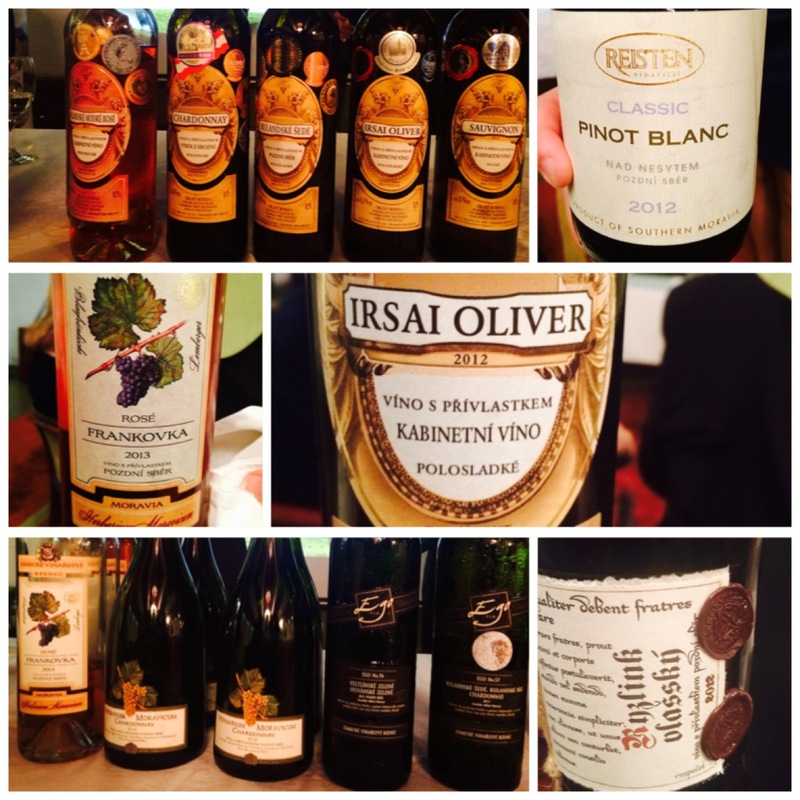 A top Czech sommelier by the name of Aleš Pokorný had flown down to conduct the wine tasting session which threw up some great surprizes. The session began with him telling those present from the wine fraternity that the wine classification in Czech Republic is different from the classic wine regions like France and Italy and is based primarily on the sugar content of grapes, at the point of their harvesting and before fermentation. The lowest degree in wines is represented by Kabinett wine where the grapes reach 19 to 21 degrees of sugar, giving lighter dry wines. Higher sugar content can be found in Late Harvest, while grapes of 27 degree sugar and more are classified as semi-sweet and sweet like Ice wine and Straw wine. Still white wines are the main domain of Czech and Moravian viniculture accounting for 71% of wine production followed by red and some sparking. He told us how there has been a marked improvement, both in the quality and quantity of Czech wines, with their wines winning awards at some of the world’s top international competitions. However Moravian wines are relatively unknown outside of Czech Republic as the country is more famous for its beer. 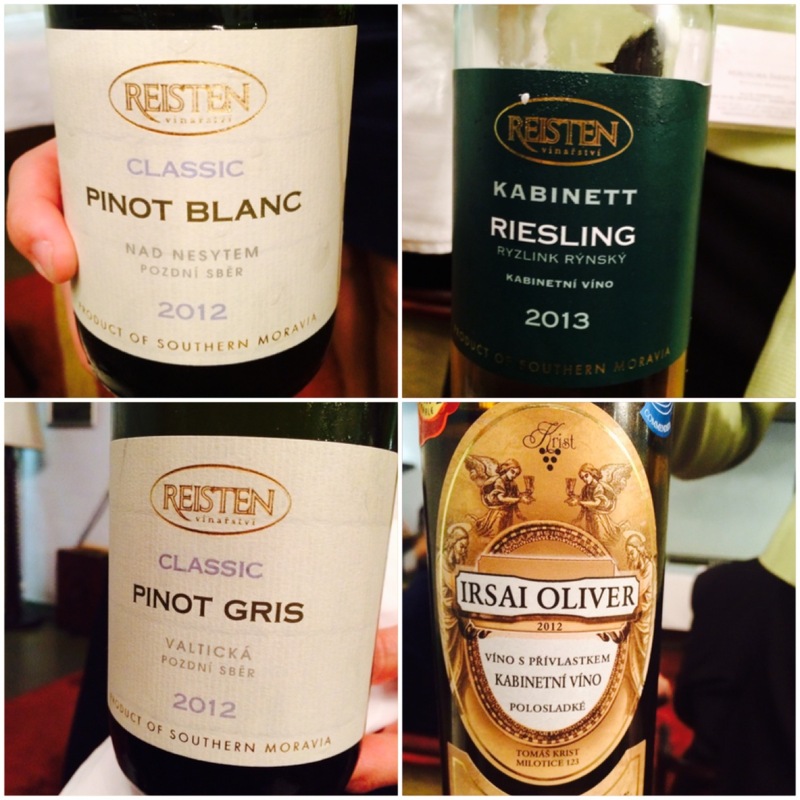 We began the wine tasting with a 2012 Pinot Blanc from the winery Reisten Pavlov. This was a dry fruity wine with residual sugar of just 3gms per litre. The nose was not very aggressive and the wine had good acidity and reflected the mineral soil characteristics of that area. Next was a 2013 Riesling which had a nose of peach and melon a good balance between the sugar and acidity with a longer finish than the Pinot Blanc. The 2012 Pinot Gris from the same winery had delicious aromas of freshly baked bread along with the fruity notes. We then moved on to three wines from winery Krist Milotice, a 2013 Sauvignon Blanc, a 2011 Rulandské šedé (Pinot Gris) and the find of the evening for me a 2012 Irsai Oliver. This is a Hungarian wine variety also popular in Moravia and is similar to Pinot Grigio with a distinctive Muscat character. I loved its aromatic and floral nose and sweet mineral finish with a slight saline touch. I can see it pairing very well with spicy Indian chicken dishes. While the wines were of good quality what impressed me most were the beautiful labels which were more like a work of art and a far cry from the poor labeling of Czech wines during the communist regime. Imagine covering these with staid labels while complying with the FSSAI (Food Safety Standards Authority of India) regulations listing flavours, additives, list of ingredients and other official data. What a tragedy that would be. It may take some time for the Czech wines to see the light of day in the Indian markets, but at least a beginning has been made in terms of tasting and appreciating, thanks to the efforts of the Embassy of Czech Republic in New Delhi.